Yay! It's time for another La-La's Weekly Wednesday Challenge! Wow - can you believe this is already our tenth challenge? Time sure flies when you're having FUN! This week our challenge was set by the talented Lisa and here's what she said: "My challenge is to use ribbon as your main embellishment. It doesn't have to be the only one, but let's show off our best ribbon design work!" I added a lot of layers (all sponged with the same ink and machine sewn), and a sentiment flag. I punched 2 snowflakes out of glitter cardstock and poked a brad through each one that was tied with a bit of ribbon. Two of the layers were wrapped with the same ribbon, and then the snowflakes attached over the ribbons. 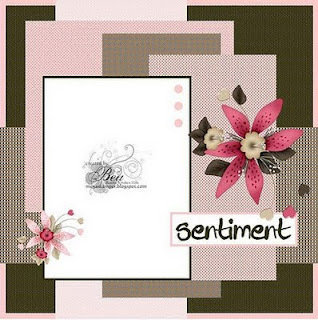 Daring Cardmakers - Favourite Things: use 5 of your favorite things (papers, embellishments, tools, styles, etc.). Mine are patterned paper, sewing, ribbon, Nestabilities, and coloring! We hope you'll play along with us this week - all the details can be found on the La-La Land Crafts Blog. And don't forget to check out all the amazing creations from the DT and Guest DT! TFL! 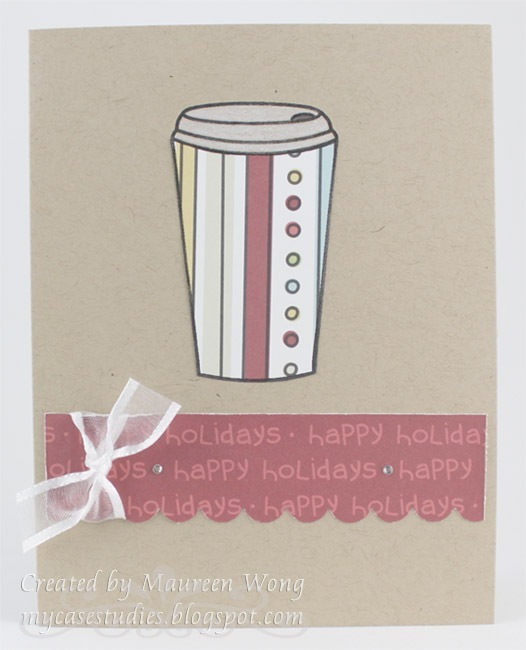 I stamped the cup on the kraft cardstock base and also on the striped patterned paper. While waiting for the ink to dry, I cut a strip of the happy holidays paper and punched it with the scallop border punch, tied on a bit of ribbon, and glued on 2 teeny Swarovski crystals. By now the ink was dry so I cut out the bottom portion of the cup from the PP and glued it to the base. I quickly colored the top with colored pencils and glued the border underneath the cup. Definitely less than 10 minutes to make and easy to mass produce! I hope you like it and TFL! Happy Days Pile It On! In case you don't already know, Stamps and Smiles has a fun project challenge every Tuesday and this week they challenged us to make shaker cards. I haven't made a shaker in a LONG time, so I jumped on the inspiration! I stamped the mermaid, colored with Copics, added Stickles to her tail, then cut her out and popped her up with foam boosters. I cut 2 different papers for the background, then added the homemade rick-rack strip (cut with giant scallop scissors) over the seam. I used 2 layers of craft foam to make the shaker and added clear micro beads for the shakey part. I have to say I'm having a ton of fun just shaking the card around! Lastly, this card also fits the Paper Blooms challenge - make a circle card. I hope you like it and TFL! Today I have a card that I made for a bunch of challenges and also because I really wanted to use my Witch Lala stamp from La-La Land Crafts! I colored Lala entirely with Copics except for the line of green around her irises and the white hi-lights both done with colored pencils. She was then cut out and popped up on foam boosters. The papers and sentiment are from the My Mind's Eye Boo to You! collection. The sentiment was actually cut from that extra little strip on the bottom of the 12x12 paper that has the manufacturer and collection name on it! Whew! What a list! I hope you like my card and TFL! If you're looking for the Your Next Stamp Challenge #2 post, it's directly below this one. Thanks! It's time for another fun La-La's Weekly Wednesday Challenge! This week our theme was set by our awesome DT Coordinator Jane, and is Sparkle! You can use glitter, Stickles (or other glitter glues), glitter pens like Spica or Stardust, or any embellishments that sparkle on your projects. I colored Rosie with a combo of Copics and colored pencils blended with odorless mineral spirits (definitely my fave coloring method for Rosie - I just feel like it suits her!). I added some AIG glitter to the dots on her dress, the Nestie mat, and also the sticker letters. I still had the SEI Chick-A-Dee collection out from a previous card so I used it for this one too, and I followed the Unscripted Sketch 27. Don't forget to check out all the amazing DT and Guest DT creations (links in my sidebar), and we'd love to have you play along with us! All the details can be found on the La-La Land Crafts blog. TFL! I stamped the penguin once on white cardstock and once on the polka dot paper. Then I colored the white version with Copics and cut him out. He was popped up with foam boosters onto the polka dot version, which was cut out and layered onto the red scalloped circle. I used the following Imaginisce papers: Sugar Sprinkles (polka dot), So Beary Merry (red scalloped circle), and Comfy Cozy (snowflake). I cut the top out of silver cardstock and added a bit of silver cord as a "hanger," then finished off the card with some hand stitching, ribbon and buttons. Lastly the sentiment is from The Cat's Pajamas (Deck the Hall set). We'd love to have you play along with us and we only have one rule for our challenges - you must use a Your Next Stamp image. If you don't have any yet, you can still play! The Halloween digis are available in the store and I can think of some great shaped cards that would go perfectly with them! For the full details about the challenge, please see the YNS Challenge blog. TFL and have a great day! I used the Flying High Fhiona set and a Mojo Monday sketch (flipped on its side). I stamped Fhiona, colored with Copics, and paper pieced her dress and balloon. Then I cut her and the balloon out. I stamped just the little portion of string on the blue paper and then glued Fhiona and the balloon down to match the bit of string. The clouds were stamped and cut out, and then mounted with foam boosters. Lastly I stamped the sentiment (also from the set) right onto the patterned paper with the help of a stamp positioner. I hope you like it and TFL! Other materials used: patterned papers - Fancy Pants (Daily Grind collection); border punch - Martha Stewart. I used Whiskers with Pumpkin and some adorable papers from My Mind's Eye. I watercolored the image with Peerless watercolors, then finished off the card with some ribbon from my stash, a Prima flower with crochet thread (to look like a spider if you couldn't tell! ), and a hanging charm. The border punch is from Martha Stewart. I hope you like it and TFL! ETA: This is my last official post as part of the Softpencil DT. I've made the very difficult decision to leave the team, but I still love Elizabeth's images so I'm sure I'll have more Softpencil cards in the future! Thanks so much to Elizabeth for having me on the team!! I colored the image with a combination of Copics and colored pencils blended with odorless mineral spirits. I also added some Stickles to all the snowflakes and the ground lines for sparkle. I printed and cut out larger versions of the girl and bunny and colored them both with Copics. The snowflake dangling in the center is a Sizzix die that I used on Doodlebug Sugar Coated Cardstock. I drew in the ground lines and the snowflakes and sentiment are from C.C. 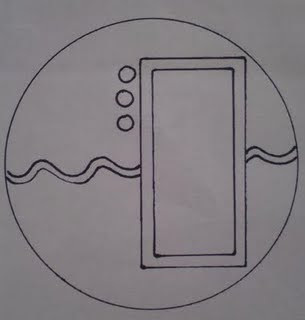 Designs. I hope you like it! I just wanted to remind you about the Softpencil Challenges that are going on over at our Paper Craft Planet group. We'd love to have you come and play! And lastly, don't forget to check out what all the other DT gals did with this image and challenge! TFL! I was so happy to play with Christmas Kirby because I'm definitely a dog person and he's just adorable! I used a sketch from Unscripted Sketches and some fun papers from the Imaginisce Polar Expressions line. We hope you'll play along with us this week! All the details are on the La-La Land Crafts blog. TFL! Other materials used: ribbon - May Arts; button - Papertrey Ink; glitter chipboard letters - American Crafts; border punch - Fiskars; silver cord. There was another reason why I made this card - it's also to celebrate the birthday of my fellow Pile It On! and La-La Land Crafts DT member, Kim!! If you have some time, please pop over to her fab blog and wish her a happy birthday, and you could also congratulate her for winning The Greeting Farm's Design My Sprout Contest (here's her post about it)! Kim, if you're reading this - I hope you have a most wonderful day!! Materials used: Fairy Good Day stamp set - There She Goes; patterned papers - Memory Box; ribbon - May Arts; flowers - Prima; Copic markers; Stickles glitter glue; bead caps and jump rings - Firemountain Gems; brads - Pink Hedgehog Paper Crafts; tiny rhinestones and charm - ebay. Hi! If you're looking for the La-La Land Crafts Blog Hop, it's the post directly below this one. Thanks! Yay! We have our first Challenge at Your Next Stamp today! But before I get to it, I have a winner to announce from my World Card Making Day post. I had many comments, but only 7 that listed their favorite YNS stamp/stamp set. I used Random.Org and it chose #1 (wow - when does that ever happen?! ), and that lucky person is Angela! Angela, please email Karen (karen (at) yournextstamp (dot) com) to claim your 2 free digi images! This card also qualifies for A Spoon Full of Sugar's Halloween challenge. We'd love for you to play with us! All the details can be found on the Your Next Stamp Challenge Blog. And remember that these digi images are only being sold for a limited time, so if you love them, hurry over to the YNS Store! They can all be found in the Limited Edition section. TFL! Other materials used: patterned paper - SEI; ribbon - May Arts; charm - eBay. La-La Land Crafts Blog Hop! 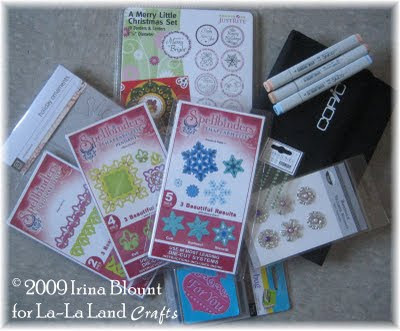 Welcome to the La-La Land Crafts Christmas Release Blog Hop! If you started at the La-La Land Crafts blog and came here from Kim's blog, then you're on the right track! If you are just stopping by and want to join the Blog Hop, then just go to the La-La Land Crafts blog and start your hop there. To celebrate the release of the fabulous Christmas stamps on October 14th, we are having a fun Blog Hop. Each DT Member and all the Guest DT members will show you a sneak-peek of one of the new Christmas stamps! Some of our DT members and the Guest Designers are also offering a little prize, randomly chosen from the entries on their own personal blogs. What do you have to do to join our Blog Hop???? Your next stop is Paul's blog. Have fun and good luck to all of you! I also added Stickles to all the candle flames, then finished off the card with stitching, May Arts ribbon, and a rub-on sentiment from Basic Grey. All the patterned paper is Basic Grey's Urban Prairie collection. Karin: if you're reading this - Happy birthday!! I hope you have a most wonderful day!! Happy World Card Making Day! I hope you're enjoying the tons of fun going on at all the various boards and blogs today! In case you missed it, Your Next Stamp is sponsoring this week's challenge over at The Pink Elephant, which is a recipe challenge: Use something with dots, a punch, and a tag. There's still time to play and two stamp sets up for grabs!! And now for something really fun: one random commenter from today's post will win a prize of 2 free digi images from YNS! Yes, YNS is going to be carrying digis for a limited time! They will be released on October 7 (which is also the first day of our new challenges! ), so I hope you'll check them out! To be entered to win, all you have to do is check out the Your Next Stamp store and leave me a comment telling me what your favorite YNS stamp/stamp set is. This giveaway will be open until Oct. 5th at 12 midnight EST and the winners will be announced on the YNS Blog on Oct. 7. Did you catch that I wrote winnerS? Check out the other Starlets and enter to win their giveaways too! Check the complete list of players on the YNS Blog to make sure you don't miss any! Also, Karen is giving everyone 10% off their order for today only!! The offer is good until 12 midnight EST. Have fun shopping! I'm glad you're still with me! You can also enter to win some candy over at the La-La Land Crafts blog! Be sure to check it out! 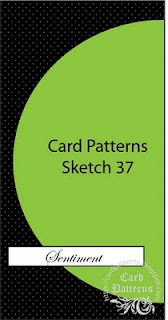 And last, but not least, I wanted to remind you that the Softpencil challenges start today over at Paper Craft Planet. We hope you'll play along! Whew! Thanks for getting through this looooong post!! Enjoy all the rest of the WCMD activities! Hi everybody! To kick off the start of the new Softpencil Challenges, we're having our very first blog hop! If you didn't start at the Softpencil blog, you'll want to go back to get all the details of the hop! I bought a very lightweight watercolor paper from my local craft store just so I would be able to print digi images from my printer. I used Peerless watercolors and a waterbrush, using lots of different reds and greens (and then grey for shadows) in layers. Lastly I did a yellow halo around the entire image. The sketch is from Mercy's Tuesday Sketch Challenge and my card also qualifies for the CCEE Stampers' challenge - "Let's Go Digital!." And then back to the Softpencil Blog for a chance to win a prize! The Softpencil challenges will start on Saturday, October 3 at the Softpencil group at Paper Craft Planet. We hope you'll join us!! I hope you have fun with the rest of the hop and good luck winning a prize! And now your next stop is the fabulously talented Wendy!